PowerShell has come a long way over the last 10 years. You can now download the dbatools module from the PowerShell Gallery, right from inside of PowerShell itself. If you’re running PowerShell 5+, simply run this command from an elevated shell and you’ll be ready to go. If you’re stuck on PowerShell 3, you can use this command to download the latest release of the dbatools module from the GitHub repository. Today we’re going to take a look at a new command in the dbatools module called Read-DbaBackupHeader. This command will allow you to cross-reference backup files on your SQL Server’s local drive or network share with information from your SQL Server’s backup history. The great thing about having a command like this is that you probably don’t need to look at this kind of information very frequently, so having a command that already has the relationships worked out and has demos on the kind of data you can expect to retrieve with it is a huge help in letting you to get through some infrequent task and back to what you love doing the most. This will give you in the neighborhood of 60+ different pieces of information (properties) about the backup file. Some of these properties will be useful to some people while other properties will be useful to others. Next I’d like to focus on two sets of properties I’ve found quite useful over the years. On a number of occasions, I have found myself trying to restore a backup that was too big for where it was trying to be restored to. Worse yet, is when you are trying to restore multiple databases and the first few succeed but then you run out of space and the last few end up failing. Wouldn’t it be great if you could know how big each data & log file inside the backup file are going to be once you restore them? Read-DbaBackupHeader makes retrieving this information pretty simple with the -FileList parameter. This parameter is nice because the backup file contains multiple files, so when using this parameter, the command goes ahead and does the work of unwinding that array or properties into rows for you to work with. 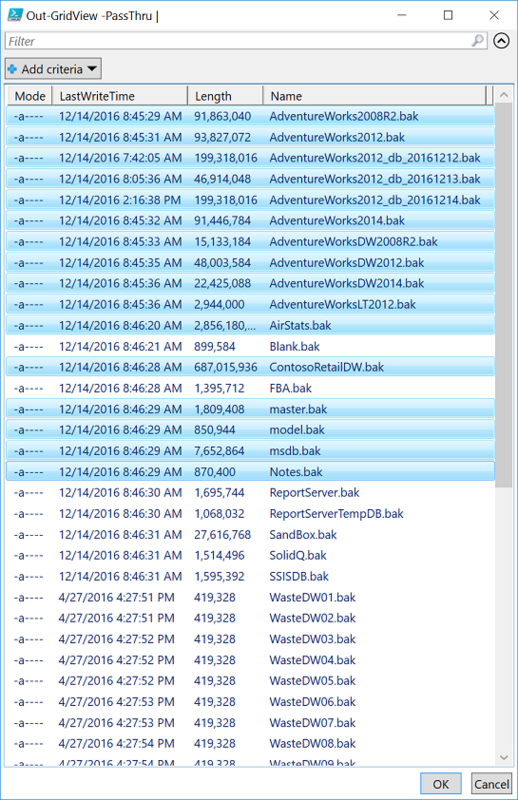 Using the -FileList parameter you will see another 20+ properties for each data & log file within the backup file. In this case, I’m really only interested in the file itself and its size so I will pipe the results out to the SELECT cmdlet and specify the columns I want. By default, the “Size” is reported in bytes. If you want to convert it to MB or GB that’s easy to do by adding some formatting syntax like this. That’s great information, but what if you needed to get this information for multiple backup files that you were restoring? It only takes a small adjustment to the code to make that happen. Instead of looking at a single file we will take the stem of that directory path and do a Dir on it. We then pipe those results over to the Read-DbaBackupHeader command and presto, we have a list of all the data & log files and their sizes for every backup file in the directory. Of course, you may not be trying to restore every backup file in the directory, but maybe a handful. In this case we can use one of my favorite features of PowerShell, the Out-GridView cmdlet and its -PassThru parameter to thin down the list to only the backup files you care about, before sending the list on down to the Read-DbaBackupHeader command. Backups, were they compressed or not? Finally, let’s have a look at the backup files and whether they are compressed or not. You probably have your backup compression defaulted to 1 or True but even if you do, a process could still be backing up a database without backup compression turned on, costing you space. To inspect the backup files to see if they are compressed or not, simply take the same command we were using above (remove the -FileList parameter) and change the properties you’re SELECT’ing to DatabaseName, Compressed, BackupPath. At this point you could pipe the results to the Out-GridView cmdlet to filter and analyze them further. When you do that PowerShell will pop up a grid of results, similar to the Results to Grid setting in SSMS, except a little better. At the top of the window that pops up, there is a search box with the word “Filter” ghosted in it. If you type something in here it will filter every column on every row for that search term. Alternatively, you can click on the “Add Criteria” button and choose to filter the results in the grid based on the values in only a single column. Adding the “Compressed” column and giving it a value of “0” will filter those results down to just the backup files that weren’t compressed when they were created. From here you can work on tracking down what process created those backup files and see about getting them converted to using backup compression. Again, these are tasks that I would do very infrequently myself, so having a PowerShell command that can help me sort out the information quickly makes it so that I won’t have to remember much to get these tasks done. Aaron Nelson is a Consultant with SolidQ with over 15 years of experience in Architecture, Business Intelligence, Development, and Performance Tuning of SQL Server.He is a 6 time recipient of the Microsoft MVP award for SQL Server (Data Platform).Aaron holds certifications for MCITP: Business Intelligence Developer, Database Administrator, & Database Developer. Aaron leads the PowerShell Virtual Chapters of PASS, and volunteers for the local PASS Chapter AtlantaMDF, and helps organize SQL Saturday events in Atlanta.